I'm not sure which animal was killed to create this pink fur coat, but I sure hope it wasn't a Care Bear. Oh wait, it's fake fur. How much fun is all this texture?! 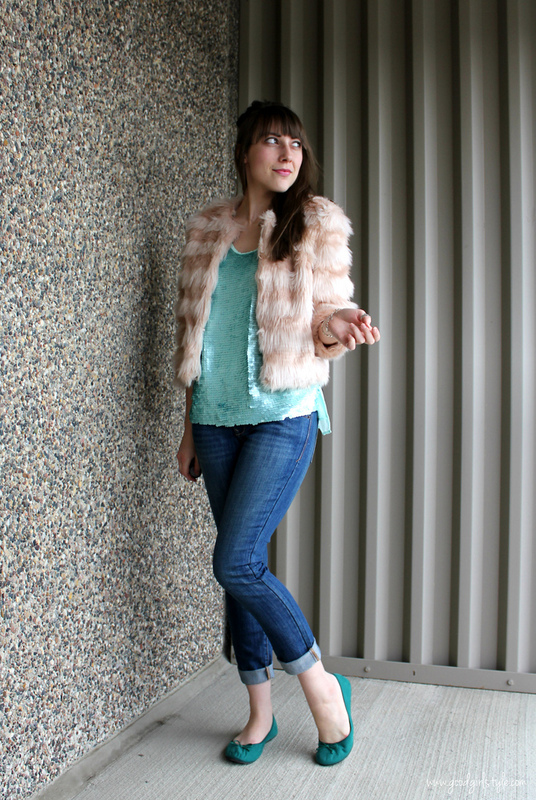 Fur jacket, paillette (big round flat sequins, usually matte) "Mermaid" top, jeans, and suede ballet flats. I love being able to wear this fur jacket and sequins for a casual outfit. Sometimes you just gotta say, "Today's a fur jacket day!" even if there isn't any special occasion. Pink fur kind of IS its own occasion. And so is Thursday night. So I think that calls for a jump-up-and-down, throw-your-hands-in-the-air worship song, right? Totally.